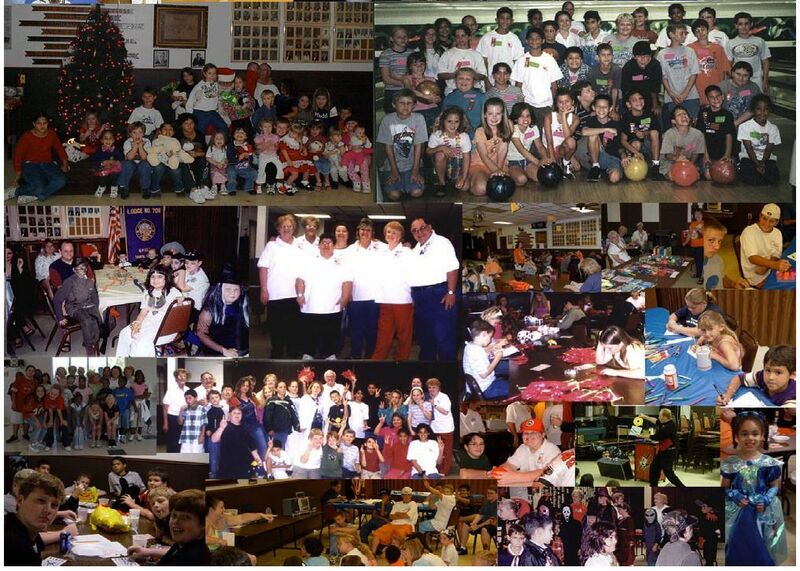 Our Elks lodge sponsors Free Drug Awareness and Youth Activities for community children. We are very proud of our successful local “Just Say NO Kids Club” at the Tampa Elks #708, where many local school children attend our free, fun, and educational events, field trips, dance parties, etc. All of our youth program events provide the community youth with a Fun and Safe place for the afternoon, free from Drugs, Alcohol, Tobacco, and Violence. Typical annual events include some or all of the following FREE Events scheduled for the youth within our community. Note that the dates and details are subject to change, so see the Elksize, calendar and committee members for details. Bowl-A-Rama - (May) Bowling Fun - 2 Free Games/Shoes - Trophies & Certificates, Free Lunch & Give-aways. Prizes for Mother's Day Poems/Cards in our special Mother's Day presentation. Summer Field Trip - (June) - A special Field Trip is scheduled for late June where we will be taking the kids to either a Movie, the Zoo, MOSI, or some other special field trip with Free Lunch provided. Back To School Party - (August ) Free School Supplies to each Child, Drug Awareness Poster or Poetry Contest with Prizes to the Winners, & Certificates for All - Special Drug Awareness Speakers & Demonstrations from Tampa Police K-9 Unit, Games, Prizes, Karaoke, Surprise Entertainment, and Free Lunch. Halloween Party - (October) - This is a Spooktacular Halloween Carnival with Games/Prizes, Costume Contest, Spooky tales & Music, Special Entertainment, and lots of good Goolish Food. Hoop Shoot - (December) Best out of 25 Free Throws National Elk Competition -Boys & Girls Age Categories 8 - 13 - Local Level competition where 1st place winners proceed to District, Regional, State & National competitions funded by the National Elks Assoc. Trophies & Certificates and Free Lunch provided. Christmas Party - (December) – Kids will make Christmas cards to give to our Veteran’s at the VA Hospital. Free Christmas Gift for each child - Christmas Crafts - Games/Prizes - Music/Dancing - Surprise Entertainment - Special Drug Awareness Presentation & Free Lunch. Valentine's Party - (February)- Games/Prizes - Valentine Entertainment, Special Drug Awareness Presentation, and Free Lunch. Easter Party - (March) - The "Just Say No Kids Club" sponsors a Free Easter Party for smaller children under 8 years old. The Kids entertain the little ones with Games, Prizes, Music, and Entertainment. Each child receives a large Easter Basket full of Goody's and Free Lunch. The Tampa Elks #708 B.P.O.E. is a non-profit charitable organization with a strong commitment in helping to ensure the "Youth of Today, Become the Leaders of Tomorrow". Our Drug Awareness and Youth Activities are completely FREE to the Youth within our Community. Our programs are designed to give local children a fun and educational experience, as well as, a safe place to go to be themselves, and be part of a caring and loving environment. Dangers of Alcohol, Tobacco, and Drugs, and how to "Just Say No"
We are very proud of the success we have had over the years with our Youth Program, and appreciate the support we get from our members and local businesses and organizations who also care about making a difference in the lives of the youth within our community. We are always looking for volunteers to help with our events, so please contact me if you would like to be involved in a very rewarding youth committee. The Benevolent and Protective Order of Elks (BPOE) is one of the oldest and largest fraternal / charitable organizations in the country, with more than 1.5 million members, in 2,300 local lodges, in all 50 states and the District of Columbia. The Elks devote a great deal of attention to youth programs, and has always considered the youth of our nation its most treasured natural resource. The Elks National Association is very proud of the fact that we are second only to the federal government in awarding College Scholarships each year. Our Florida Elks Children’s Mobile Therapy Services provides Free orthopedic therapy throughout the state of Florida in the comfort of the child’s own home. This program has received numerous awards and has had a dramatic influence on the lives of needy children throughout the state. The Florida Elks Youth Camp in Umatilla Florida, has been noted as one of the best youth camps throughout the nation, and many needy children attend the camp each year completely free with money raised from local lodges. The Elks are also very committed to supporting the Veteran’s of this nation, and our volunteer work and support programs at local VA Hospital’s and Nursing Homes is unprecedented. "ELKS CARE, ELKS SHARE" is our national slogan. THANK YOU for supporting our Drug Awareness & Youth Activities program, so we can continue our goal of ensuring the youth of today, become the leaders of tomorrow! The “JUST SAY NO” Kids Club at the Tampa Elks Lodge is open to all kids ages 6 – 16 in our local community. Our goal is to provide a Safe and Fun environment where children can also learn about the dangers of Drug, Alcohol, and Tobacco use. Our club events give children something much better and productive to do with their time, surrounded by caring and supportive adults and friends. 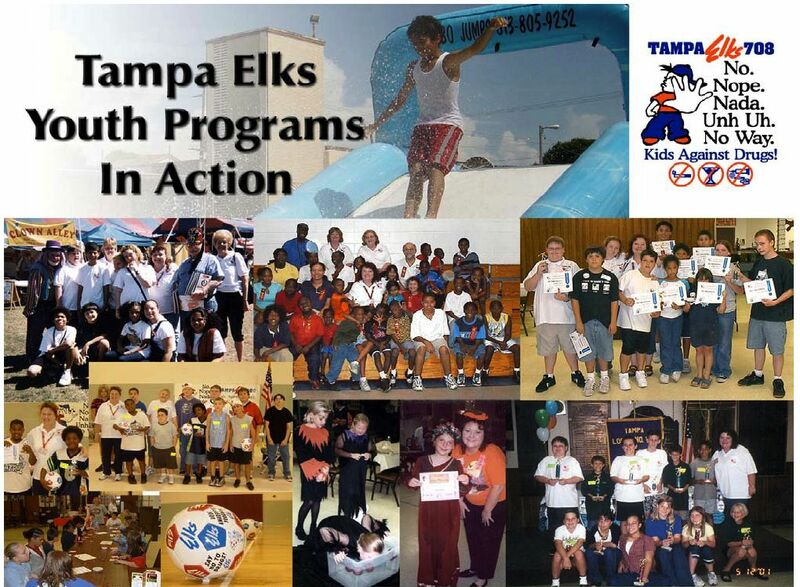 We are very proud of the fact that our club has tripled in size in the last two years, and the kids are spreading the word that the Tampa Elks "Just Say No" Kids Club is a cool and fun place to be. Some of our club members have been with us for over five years, and many of them have made life long friends. Fun Games, Bingo, Relay Races, etc. Field Trips – Circus, Movies, Zoo, Pizza Parlor, Skating, Bowling, Baseball game, etc. Special Entertainment – Magicians, Puppeteers, Storytellers, Mad Science, Animal Shows, Canine demos, Balloon Sculptures & Face Painting, etc. Christmas Party, Halloween Carnival, Valentines Party, Back To School Party, etc. The kids never go hungry with Hamburgers, Hot Dogs, Pizza, Ice Cream, Soda, Cookies, etc. We also teach the kids how rewarding it is to give of themselves, by making Christmas cards and singing Carols to the elderly of local Nursing Homes. We have also done the same with Valentine’s Day and Easter, and it is very touching to see how much the patients appreciate the kids. There are also many under-privileged "very appreciative" kids who attend our events from local shelters for neglected, abandoned and abused children under the protection of the state. The Tampa Elks Drug Awareness & Youth Activities Committee is made up of several hard working dedicated individuals who are committed to making a difference in the lives of the kids in our community. If you would like to get involved in our worthwhile cause, or know of children that can benefit from our FUN club, contact the Youth Activities Chairperson or other committee members.